The Symbol SPS 3000 has been discontinued. No direct replacement is available. The new SPS 3000 is the first expansion pack that delivers integrated data capture and real-time wireless communication to users of the Compaq iPAQ Pocket PC. 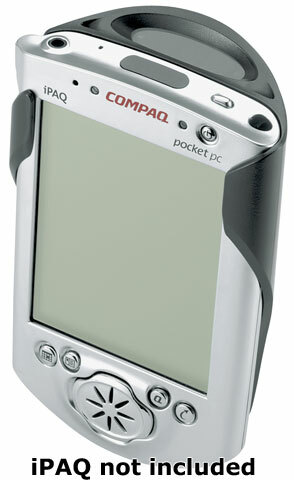 With the SPS 3000, the Compaq iPAQ instantly becomes a more effective, business process automation tool with augmented capabilities that include barcode scanning and wireless connectivity. The SPS 3000 pack attaches easily to the Compaq iPAQ Pocket PC, and the lightweight, ergonomic design provides a secure, comfortable fit in the hand. The coupled device maintains 100% compatibility with Compaq iPAQ recharging and synchronization cradles for maximum convenience and cost-effectiveness. The SPS 3000 is available in three feature configurations: Scanning only, Wireless Local Area Network (WLAN) only, Scanning and WLAN. All units ship with one product reference guide. 802.11b, 2MB flash. With scanner. 802.11b, 2MB flash. No Scanner.